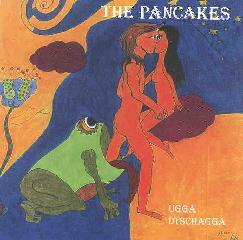 Pancakes - "Brainshaker" / "Ugga Dtschagga" / Rainer Neef - "San Francisco Howlin"
Germany is not the first country that probably comes to mind when thinking about contemporary psych/surf/garage bands, but what the hell do I know? With the exception of the accented vocals and occasional between song rants, you probably would never know. 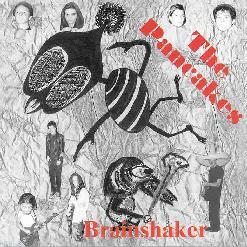 Brainshaker, the Pancakes debut CD from 1998, has moments of coolness, but in all honesty comes off sounding a bit rough, like a demo more than an actual release. They do a good job on some of the straight ahead, punchy rock songs (The leadoff track, "Surfing to the Center of the Universe" is especially nice) but on some of the songs the transitions still sound a bit wooden, like they were trying too hard to hit them and it just doesn't quite flow. Also, the production is pretty flat (no, not like a pancake damn it!) and it really kinda holds the whole party back from taking off the way it should. This is even more obvious on the muddy live take of Cream's "Sunshine of Your Love" which closes the disc. Still, it's pretty a pretty ok record, I have certainly had to sit through a lot worse. Ugga Dtschugga, their follow up from last year, finds them paired down from a quartet to a trio, but more importantly they have pretty much fixed the problems that Brainshaker has, and additionally open up a bit and explore more territory. It opens with "Toilet Blues" which is a straight up vocals and tambourine blues that does in fact sound like it was recorded in a bathroom. There are several tracks that are reminiscent of the punchy surf/garage tunes on the first CD ("Dressed in Bloom", Birthcontrol"), but they are handled much better here. Think Man... Or Astroman with female vocals and you will be in the ballpark. What I really dug on this release, however, is the more pronounced move into heavy acid rock, exemplified by "Kosmos" and the instrumental "Tornado". Great songs, and both also feature prime guitar scorch from Rainer Neef. They even throw in a cool screwed up noise track at the end. Overall this is a really solid CD, with several great standout songs. Somewhere between the two Pancakes CDs Rainer Neef locked himself in a studio and recorded a solo LP, and boy what a great, fucked up record it is! According to the press release this record "could be defined as a movie soundtrack but without any movies to support". Well, OK. To me it sounds like one of those totally great homemade twisted "I have been locked in a basement studio for a week with only my instruments and 10,000 hits of acid" psych(otic) records that occasionally manages to see the light of day. Stoned, mumbled vocals collide with searing guitar and weird electronic noises, plus a tweaked drum machine with no speed control tops it off. Side one has 8 short and screwy tracks, but the killer is side 2, titled "San Francisco Overdrive". It's a 20 plus minute mindfuck of glorious proportions. Did I mention that I love this record? Everybody that I have played it for has been pretty well floored as well, so if the description sounds like something that you would like, you probably will. For more information you can email the Pancakes at: genge@nexgo.de. Contact via snail mail c/o Werner Neeff, Gartenstr.32,72458 Albstadt, Germany.